When Jerry Siegel and Joe Shuster created Superman, they didn't ponder how his heat vision would work. Or how would he be able to fly without wings. The fascination that attracts people to comic books are the extraordinary characters. These larger than life characters have amazing abilities that allow them to do incredible things. From X-ray vision, to super strength, to even communicating with the fish, these abilities defy our own natural human abilities. Our human curiosity is always on a quest to understand how things work. 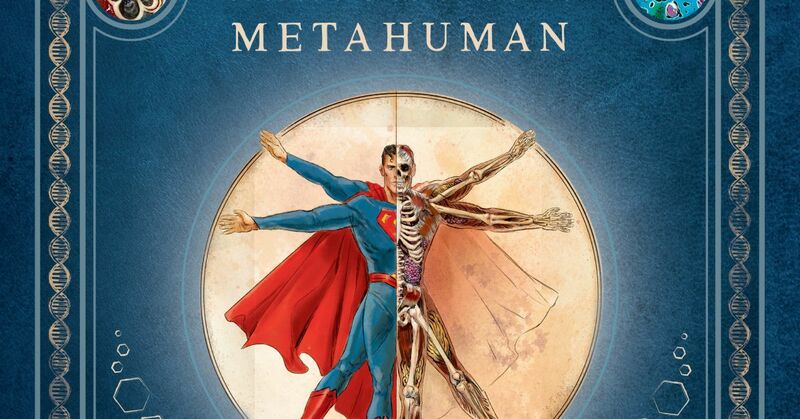 This book takes a stab at our thirst for understanding how metahumans would work knowing what we know about science. And what better character to explore this idea than one of humanities' best: Batman. So does the World's Greatest Detective crack the metahuman genome code? Let's dive in and see. At first blush, the cover of this books looks to be just an encyclopedia on metahumans but there is actually a story here. This book is Batman's contingency plan for stopping the listed metahumans in this book. He explains why he is writing this book and why it's even handwritten. It is a study from data, top-secret files, and evidence he has been able to obtain to formulate comprehensive conclusions to the specific metahumans listed in this book. 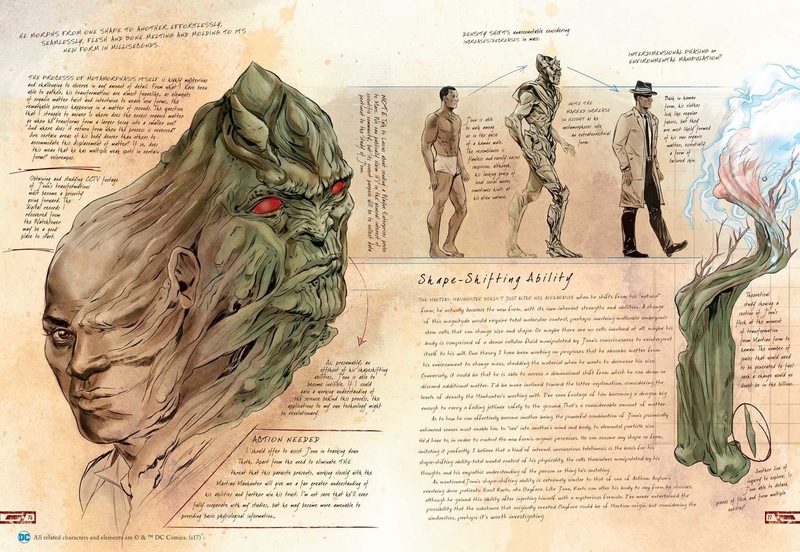 This study examines twelve metahumans ranging from aliens like Superman to creatures like Swamp Thing. Ming Doyle's art is fantastically detailed throughout the entire book. From bones to tensions, to dismantling an eyeball to review each layer and detail. Doyle makes me wonder where the hell did Bruce Wayne learn how to draw like this? The introduction of this book is Batman's reflection on himself and the reasoning behind his research. He explains that he is just a man among uniquely gifted individuals some allies and some villains. He has his limitations and has even contemplated augmenting his body to make himself stronger as a last-ditch effort. He has been injured countless times and his fragile human body can only withstand so much. This introduction humanisms Batman and puts the Dark Knight on the reader's level. He has written a detailed description of notes in the event that either he has been killed by a Metahuman or he needs the readers to help to assist in stopping one of them. He knows that any of his allies can easily be controlled or go rogue and he needs to prepare against even them. So the book has JLA Tower of Babel vibes but that could be just on the surface. There' s even a cool little warning not to duplicate this document digitally because of metahumans like Cyborg' s abilities to access data instantaneous could become threatening. His paranoia boarders on intelligent and frightening throughout the book. 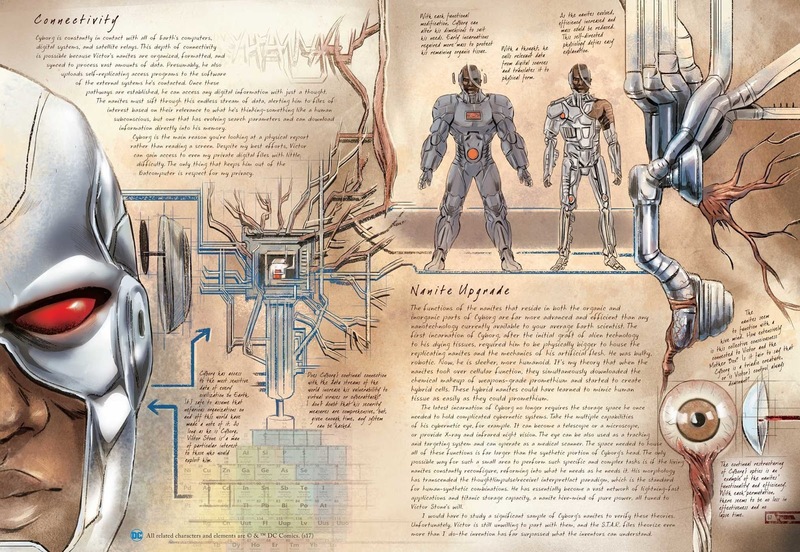 Throughout the graphic novel, Batman takes notes to himself as a reminder that he needs to improve his own equipment in the case of a confrontation with any of these metahumans or even to conduct further studies. Superman was the only "willing" participant and is allotted more pages than the others. Batman has had to covertly obtain classified documents, filed samples, eyewitness accounts, and more to formulate the information he has. I like the concept that he is given everything and that all of this research is done in secret. Often than not he doesn't have the answers to and concludes further research needs to be conducted. Batman uses scientific theories to make hypothesizes how metahumans powers work based on his understanding of science. Each chapter is made up of an introduction, background, data collection, evidence, and known weaknesses. Even the world's greatest detective can't figure out how Aquaman can withstand the crushing pressure of the ocean hundreds of miles under the sea, or how the Martian Manhunter displaces and increases mass to become a mouse or a dragon in an instant. That in itself is the charm in this book. The fact that even Batman doesn't have all the answers but can base his conclusions on his knowledge about science. It makes the whole experience intimate and realistic. For example, Batman hypothesizes that Superman must different lungs than humans because of his ability to use his freeze breath. 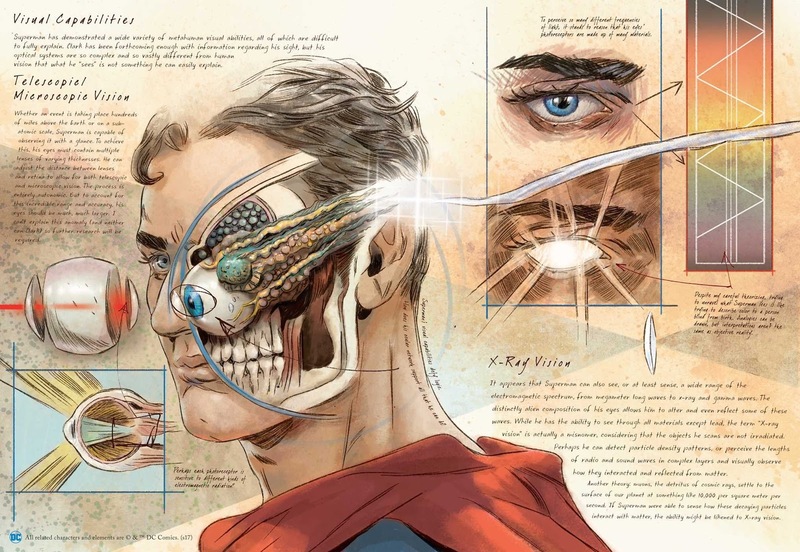 This was something I didn't think about but makes Superman's physiology make scientific sense. This is a fantastic first volume in this series of novels. This book makes the science behind discovering metahumans interesting and not boring. That has a lot to do with Batman' s narration credited to S.D. Perry and Matthew K. Manning. The art is amazing. I love the detail on every page. Ming Doyle brings realism illustrations and the colors are superb. At times, I thought I was actually reading a college anatomy book and that isn't a knock on the book. That just goes to the credit of how detailed the art is. It is very easy to get lost in this book and believe that you have actually found Batman' s notes. As I continued reading the more I couldn't help but be more invested in this book. 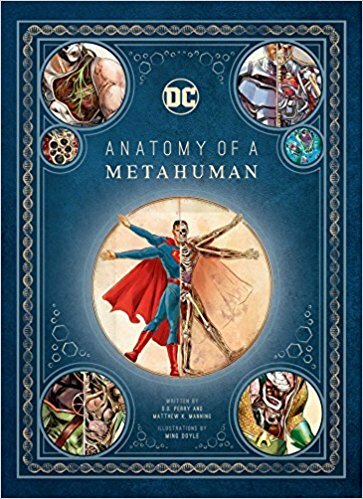 It can be dense, especially if you are not interested in the science behind metahumans but this is an absolute must-read for DC comic fans.